Here's how to keep your Articulate Storyline software up to date, take advantage of auto-recovery features, set your spelling/autocorrect preferences, configure proxy settings, and even change the interface language. Go to the File tab on the Storyline ribbon and click Storyline Options. The following window will open where you can adjust the options described below. Check for updates at startup: If you leave this box checked and are connected to the Internet, Storyline will automatically check to see if updates are available each time you launch the app. Enable publishing for manual upload to Articulate Online: If you use Articulate Online, you'd normally publish and upload your content at the same time. But if you'd like to publish locally first and then manually upload your content later, mark this box. For details on manually uploading content to Articulate Online, see this tutorial. Save AutoRecovery information every ___ minutes: Mark this box to recover your work if you experience a power outage or the app shuts down unexpectedly. Storyline will automatically save a copy of your project at the specified interval (after you’ve saved it at least once). The default interval is every 10 minutes, but you can enter any whole number between 1 and 120. If Storyline closes unexpectedly, you’ll be prompted to recover your project, the next time you open it, from the last copy Storyline stored in memory. Reset "Don't show again prompts": For some actions, such as deleting slides, Storyline displays a confirmation prompt with an option to "Don't show again" or "Don't ask again." If you mark the box, Storyline will no longer display the confirmation prompt when you perform the same action later. To turn all the confirmation prompts back on, click Reset "Don't show again prompts." 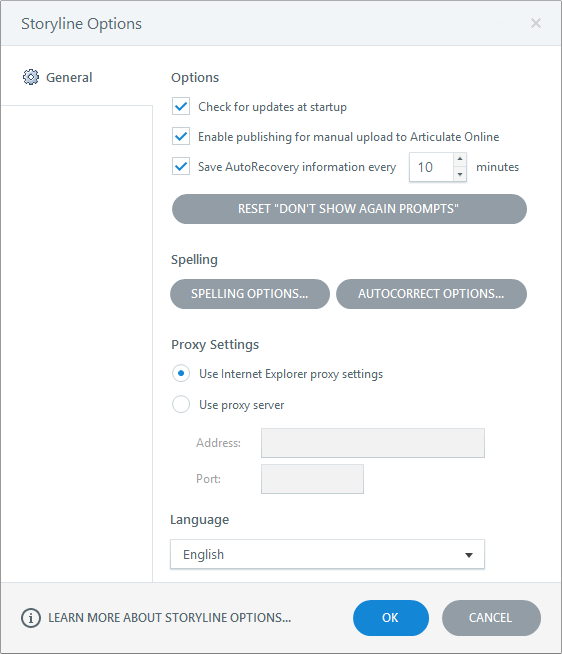 Click Spelling Options to set your preferences for the spell checker and dictionary. Keep in mind that preferences you set here will also impact other Articulate products that are installed on the same computer. (If you have Articulate Presenter installed, the spelling options in Storyline won't affect it, since Presenter uses the spelling options in Microsoft Office). Hide spelling errors: Hides the wavy red lines that normally appear under misspelled words while you're editing slides (but if you run a spell check, the misspelled words will still be caught). If you choose to leave the wavy red lines visible, you can right-click any misspelled word for a list of suggested spellings. Ignore words in UPPERCASE: Words with all capital letters won't get spell checked. Ignore words with numbers: Words that contain numbers won't get spell checked. Ignore Internet and file addresses: Website URLs, file names and paths, and syntax like mailto:biz@articulate.com won't get spell checked. Ignore capitalized words: Words with initial capital letters won't get spell checked. Ignore words with mixed case: Words that contain both uppercase and lowercase letters won't get spell checked. Ignore HTML markups: Words with HTML tags won't get spell checked. Allow accented words: Words with accented letters won't get spell checked. Report doubled words: Instances of the same word appearing one after the other will get flagged during spell check. Suggest split words: If a misspelled word appears to be two separate words, Storyline might suggest an appropriate correction during spell check. Phonetic suggestions: During spell check, Storyline will provide suggested corrections if a misspelled word resembles the phonetic spelling of an actual word. Case sensitive: This option enables Storyline to distinguish words based on the case patterns of their letters. Auto correct: This enables Storyline to dynamically correct misspellings as you type. 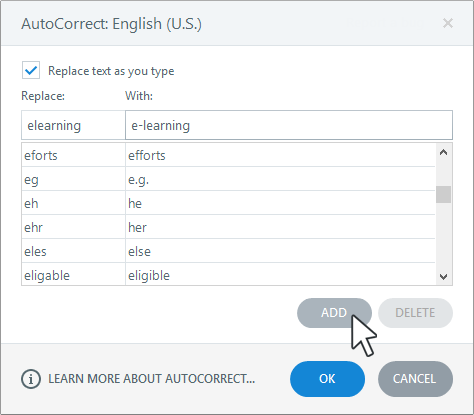 If you mark this box, you can also click the Options button to customize the AutoCorrect dictionary. See the AutoCorrect Options section of this tutorial for details. If you change your mind about any of the options you've marked or unmarked on this window, you can switch back to the default settings by clicking Restore Defaults at the bottom of the window. 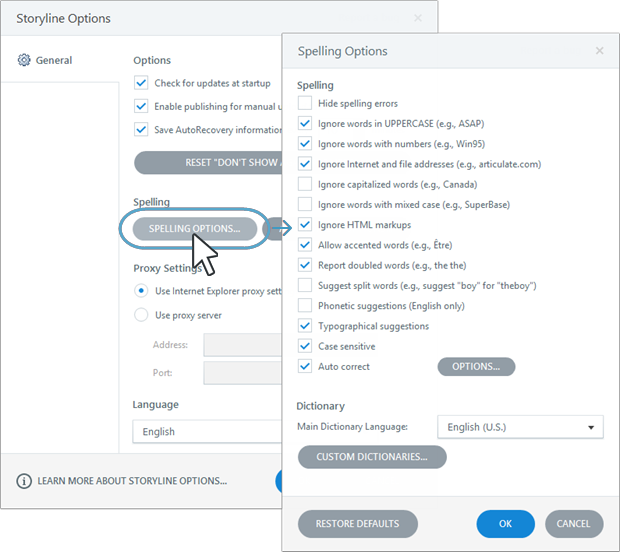 From the Spelling Options window shown above, use the Dictionary section to switch the spell checker to a different language and to manage your custom dictionaries. Use the Main Dictionary Language drop-down to choose the dictionary you want to use for spell checking. Click Custom Dictionaries to add, modify, or remove a custom dictionary. A custom dictionary is a way to supplement your main dictionary with additional words that you don't want Storyline to flag during spell checks, such as names, industry-specific or technical words, and alternative spellings. If you click Custom Dictionaries on the Spelling Options window (see above), the following window appears. Modify a dictionary: Select a dictionary from the list and click Modify. A window appears where you can add or remove words for your custom dictionary. To add a word, type it in the Word field and click Add. To remove a word, select it from the list and click Delete. Click OK when you're done making changes. 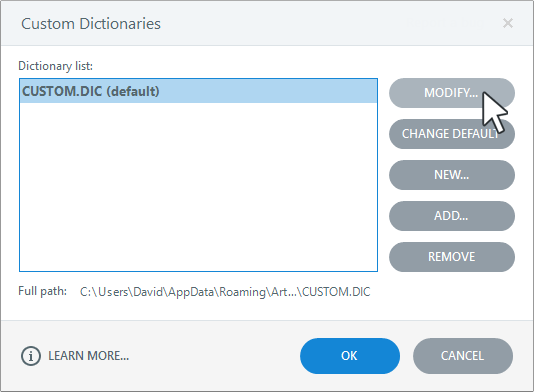 Change the default dictionary: To use a different custom dictionary by default, choose a dictionary from the list and click Change Default. 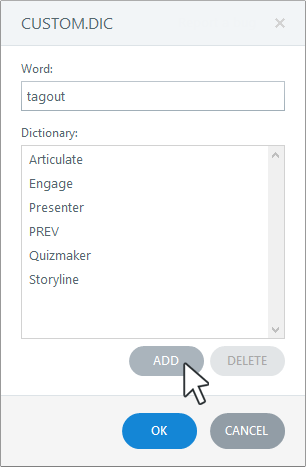 Create a new dictionary: Click New. Type a name for your new dictionary in the File name field, then click Save. The new dictionary will appear in your dictionary list, and you can add words to it as needed. Add a dictionary that already exists on your computer: This option is for cases in which you've obtained a .dic file from someone else. Click Add, browse to the .dic file, and click Open. The dictionary will appear in your dictionary list, and you can modify it as needed. Remove a dictionary: Select the dictionary you want to remove, then click Remove. This doesn't remove the .dic file from your hard drive, but it does remove it from your dictionary list in Storyline and other Articulate programs. The AutoCorrect options let you choose which misspellings Storyline will automatically correct. 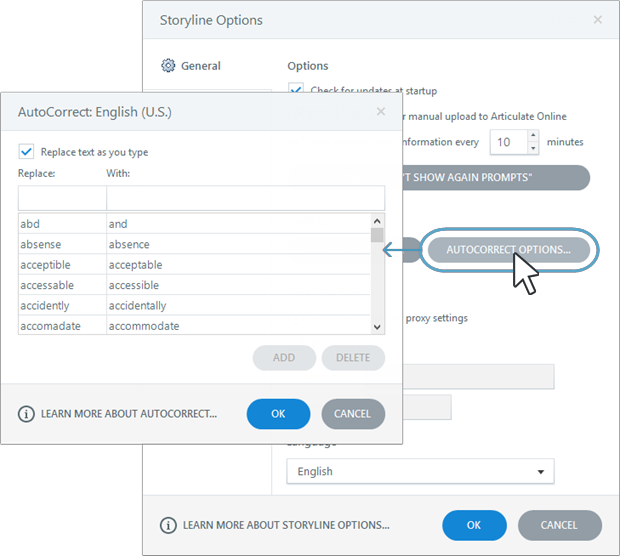 You can reach these options either by clicking the Options button on the Spelling Options window shown earlier in this tutorial, or by clicking AutoCorrect Options on the main Storyline Options window (shown below). To add a word to the list: In the Replace field, type the word you want to add. In the With field, type the word you want to replace it with. Then click Add. To remove a word from the list: Select the word you want to remove and click Delete. To change the text Storyline uses for the correction: Select a word in the left-hand column. In the With field, type the text you want Storyline to replace it with. Then click Replace. Click OK when you're done managing your AutoCorrect options. On the main Storyline Options window, there's also a section for Proxy Settings. These options are for Articulate Online users who may need to use a proxy server when publishing to an Articulate Online account. In most cases, leaving the default option selected (Use Internet Explorer proxy settings) will work just fine, but if your organization uses a proxy server, select Use proxy server. Then enter the Address and Port. Check with your IT department if you're unsure about whether you need to do this, or if you don't know the address and port information. You can localize the Storyline interface in Chinese, English, French, German, or Spanish. Just select a Language from the drop-down at the bottom of the Storyline Options window and click OK. You'll be prompted to restart Storyline for the change to take effect.